In line with an ongoing mission to set the highest standards for orthopedic excellence, Florida Orthopaedic Institute has integrated the science and art of chiropractic services within our medical model of care to create an innovative program called Orthopaedic Total Wellness. 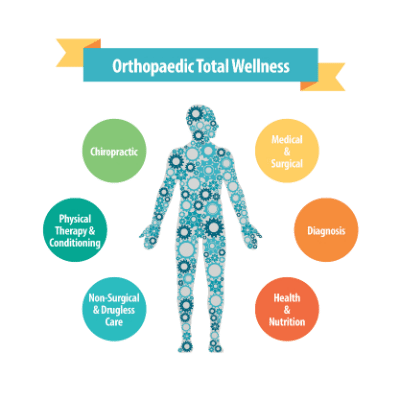 Orthopaedic Total Wellness is a progressive program that incorporates the training of functional and manual medicine with traditional orthopedics. Rarely found in traditional orthopedic care, this compliment of services provides patients with a unique and individualized experience. Working in collaboration with our medical and surgical teams, Orthopaedic Total Wellness offers patients a conservative set of options that have been effective in treating and preventing musculoskeletal conditions, without the use of medication or surgery. Non-surgical and drugless conservative care. Anatomically-based functional diagnosis of the patient’s condition. Identification of diagnosis and referral to an internal specialist, if applicable. Education associated with the future prevention of reoccurrence of the condition. Seamless continuum of care between physical therapy and orthopedics. Early detection of orthopedic dysfunction within the body. Long term drugless pain management. Upper, Mid, and Lower Back Pain, Stiffness, & Injuries. Orthopedic conditions can be particularly complex and encompass many factors such as overall health, nutrition, conditioning, psychosocial wellbeing and neurological integrity. Florida Orthopaedic Institute’s Orthopaedic Total Wellness program specializes in treatment from a whole person perspective with a goal of defining and correcting the cause of the condition while caring for the patient.